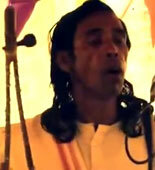 A veteran singer with mastery in many different genres, Ranojit Biswas of Asannagar, Nadia was born into a landed family in Jhinaidaha (now in Bangladesh) and spent most of his formative years in the company of numerous kinds of musicians, performers and sadhus from whom he started picking up the grammar of the many different folk sounds of Bengal. A reserved and soft-spoken man with a strong and highly-trained voice, he is a master of the Vaishnav kirtan form, with its rigorous and infinitely layered structure of rhythms and vocal ensembles, and his leela-kirtan performances are much in demand in his area. He is one of the few performers of Ramayan-kirtan this side of the Bengal border, though urban audiences know him better for his Baul singing and his authoritative interpretations of the songs of Bijoy Sarkar.